As a pre-Halloween treat, I watched the The Ghost and Mrs. Muir last night. And it’s haunting me a little. This film is subtle, elegant and thrilling. And the cast is just perfect. Rex Harrison is irascible and warm-hearted, an irresistible fantasy sea-captain. Gene Tierney is both sensitive and sensual, a genuinely complex and poignant heroine. And as with all the most memorable ghost stories, the ghost encountered by Mrs. Muir is quite real. Her ghost, the dashing Captain Daniel Gregg, is a romantic manifestation of repressed drives, unresolved longing, and unexpressed talent, some of the very real, but often painfully intangible stuff of human experience. 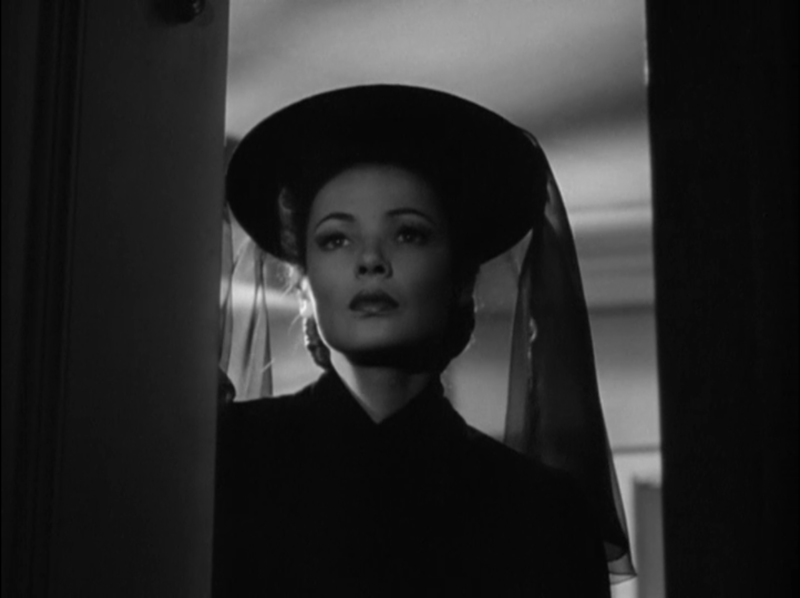 In the beginning of the film, Lucy Muir (Gene Tierney) is a beautiful young widow living with unpleasant in-laws—her late husband’s sneering, busybody sister and his helpless, smothering mother. Lucy announces that she and her young daughter will be moving out of the Muir household and finding a home of their own. Despite hysterical and manipulative protests by her female in-laws, Lucy holds firm. She wants her own home outside of London. Tierney is immediately intriguing and likeable here. Her Lucy is demure, but resolute and independent– someone to be reckoned with. Lucy determines to live far away from London. She wants a life by the sea. With one exception, the homes suggested by her agent are too expensive. Strangely, the domineering house agent insists that the only affordable cottage simply “won’t suit her” and refuses to show it. Lucy won’t accept this. She wants to see this forbidden home. This is likely the first time in the young widow’s life that she has been able to make her own decisions and politely, but staunchly, she won’t be pushed around. Mrs. Muir is shown the house. She adores beautiful, romantic “Gull Cottage”, a striking, expansive home snug against the sea. It has high ceilings, spacious rooms, and thrilling ocean views. But most importantly, it’s haunted. Gull Cottage last belonged to a deceased Sea Captain thought to have killed himself. While touring the home, Lucy and the Agent hear raucous, disembodied laughter. They exit the house in a hurried fright. But Lucy doesn’t stay frightened. There’s a beautiful scene right after their departure where you can see in Tierney’s delicate, sensual face that her imagination, her curiosity, perhaps even her ardor, are fired up by this house and its legacy. Now that she knows it’s haunted, she wants Gull Cottage doubly. By the sea is precisely the right place for Lucy to live. It’s both isolating and passion-inducing. She is safe(r) from suffocating social strictures and inspired to plunge deeply into her own psyche. The most energizing section of the film follows Lucy’s move to Gull Cottage. Her growing relationship to her house, and her ghost, are funny, sensual and enchanting. Rex Harrison’s ghost is stubborn, generous and absolutely charming. Tierney’s Lucy is ladylike, enchanted, and deeply curious. They spar and they flirt and they reach companionable compromises. It’s so cozy and sensual that you can smell the Captain’s pipe, the sea air, the gas lamps and the small long-haired dog always napping on the divan. Lucy is a powerfully interesting character. A Victorian woman whose behavior is rigidly circumscribed by the rules and expectations of her society, she achieves two impressive victories against her own oppression. First, her robust willpower (and a fortuitous inheritance) allow her to find privacy and sanctuary; She rejects family and society to create a place of her own. Second, she uses her first-class imagination to enlarge her experience and her identity. There are multiple ways to read the film, but for this viewer it’s evident that the ghost of a bold, charming, obstreperous sea captain (Rex Harrison) is the invention of Lucy’s agile, hungering mind. Through the Captain, Lucy can experience everything forbidden her late-Victorian feminine identity. The Captain argues, swears, frightens aggressors, behaves lasciviously (within respectful limits), and, through her, writes a pungent book about his adventures at sea. Lucy’s relationship with the ghost enriches her private life, but just as importantly, she uses the boldness and appetite engendered by her ghostly encounters to embark on public adventures. When her inheritance runs dry, she bravely writes a salty sailor’s book and locates a publisher, allowing her to purchase the home she loves and derive a meaningful sense of accomplishment. Further, she risks a passionate love affair with a man of flesh and blood: a writer like herself. Miles Fairley (George Sanders) is a man not unlike her sea captain, forward and lusty, creative and intense. But sadly, he is also a liar and a schemer. And unable to provide Lucy with a stable or lasting partnership. So Lucy discovers that boldness can have devastating risks. And her heart breaks, irreparably. It’s following Lucy’s heartbreak that the movie’s refreshing, pelagic energy dissipates and its tone turns toward the tragic. Lucy had courageously relinquished her ghost in order to try out a fleshly romance. But when her living beau betrays her, she gives up all her spirited passions—her ghost, her writing, her quest for a sexual/romantic partner. She chooses a small, private life instead, remaining in her beloved house with just her daughter and housemaid. It’s not a bad life, but it’s clearly smaller, lonelier, and less creative than her earlier vigor and imagination predicted. Tierney’s delicacy as an actress is particularly affecting here, she plays the aging, subdued Lucy with the resigned loneliness of a sensitive individual. 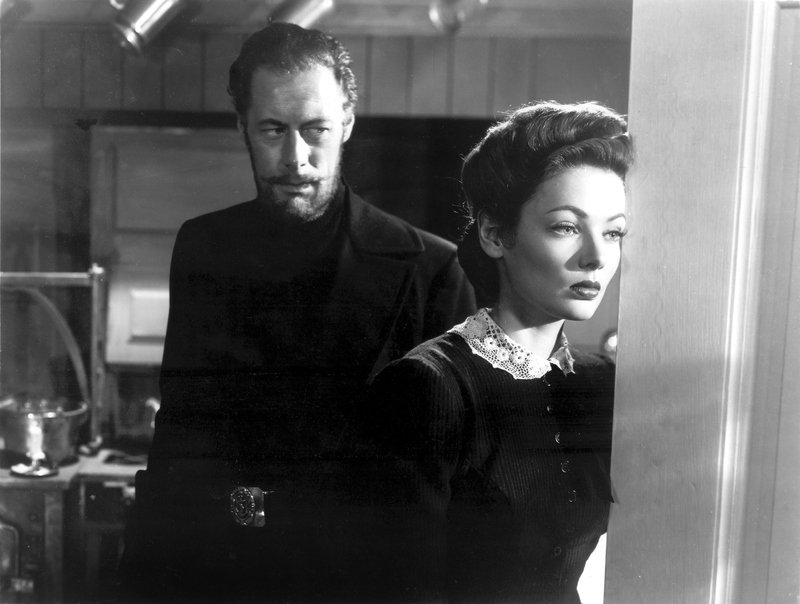 The Ghost And Mrs. Muir is an exhilarating and poignant film. It’s genuinely inspiring, charting the creative triumphs of a fragile, passionate woman in a confining world. But in the end, rather than enlivening ghost stories with her lively imagination, Lucy fades out of the world and becomes a kind of ghost herself, living quietly among her memories. Her fate, or perhaps her choice, poses a question relevant to many people of sensitive temperament. How much can one risk before seeking shelter and lying low becomes imperative? At what point must one relinquish passion in exchange for safety ? Image | This entry was posted in Uncategorized and tagged Gene Tierney, Ghost Stories, Ghosts, Goerge Sanders, Halloween, Movie Review, Rex Harrison, The Ghost and Mrs. Muir. Bookmark the permalink.